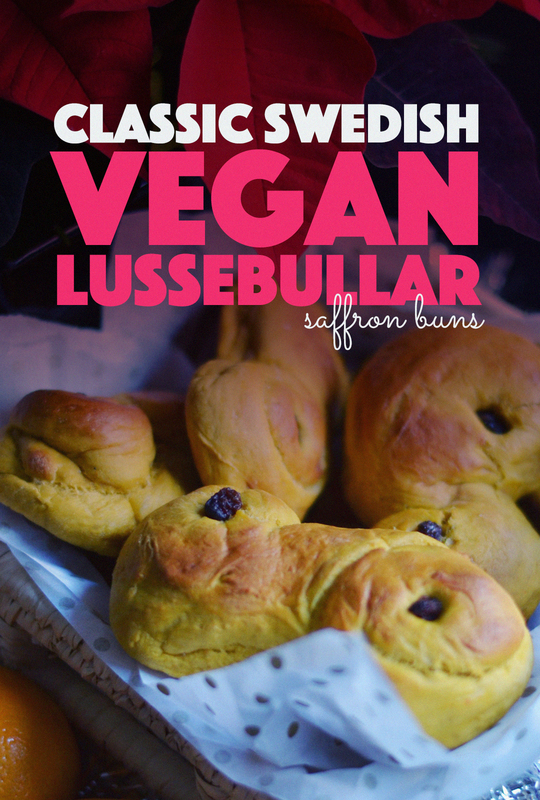 A fluffy, doughy, delicious Swedish classic in a vegan version! 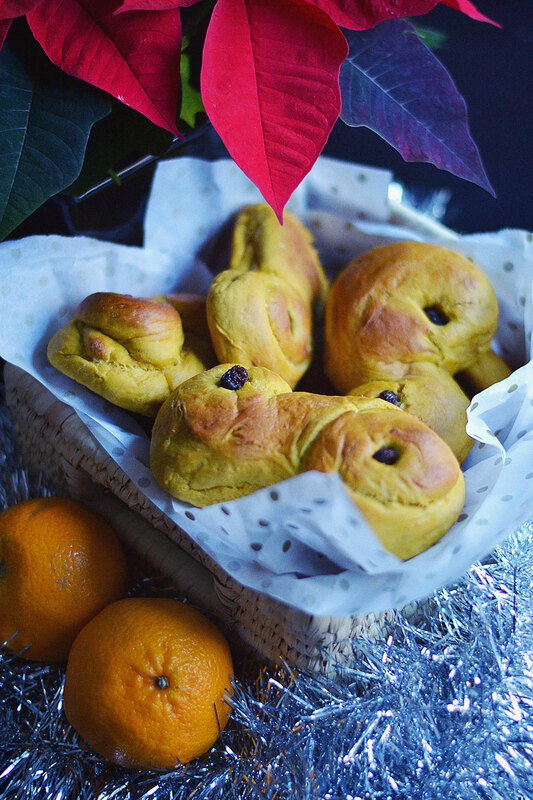 A must on the Swedish Christmas table, these Vegan Lussebullar are worth the work! 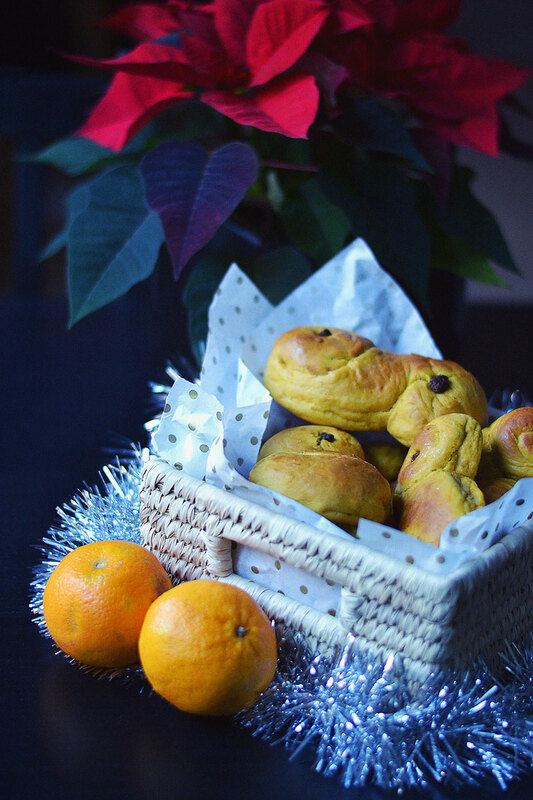 Lussebullar are one of those things that are a must at Christmas in Sweden. They’re sweet saffron flavoured buns and you can find them pretty much anywhere they sell sweet stuff in Sweden in December. Saffron is often referred to as gold, because the price for a tiny bag of it is the equivalent to the price for the same amount of gold. Saffron is perhaps more common in cooking in middle eastern countries, while we mainly use it around Christmas in Sweden. 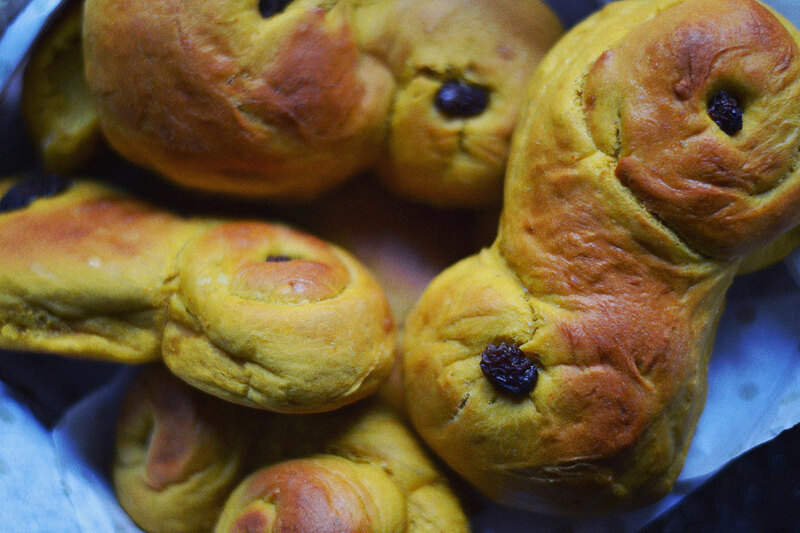 If I were to try to describe the taste of lussebullar to someone who has never had one, I’d say it’s like a slightly sweet bread bun, it’s yellow in color and has a distinct smell courtesy of the saffron spice. And every couple of bites you might suddenly taste the super sweet contrast of a raisin or two. 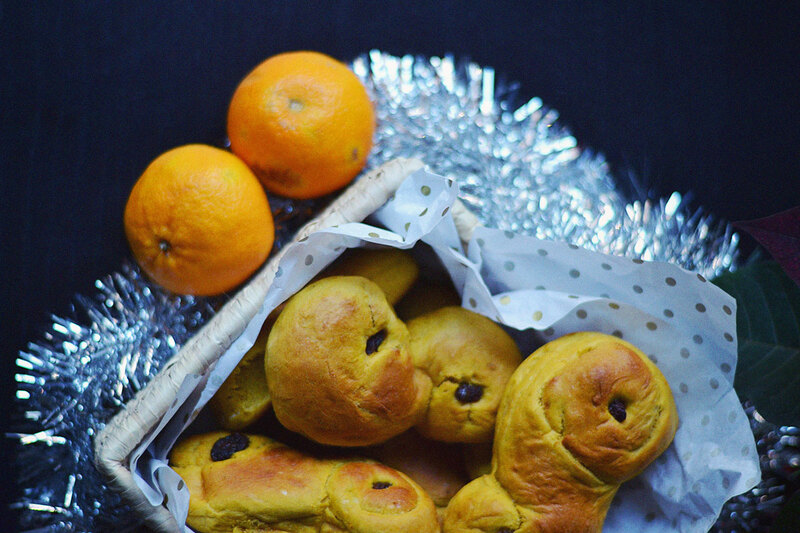 It really is as hard to describe the flavour of lussebullar as it sounds. If you’ve never tasted saffron then it’s literally impossible for me to explain what the flavour is like. You’ll just have to try it! I usually make a batch or two of these every year, for tradition’s sake, and because they’re delicious with a cup of hot glögg (spiced wine). 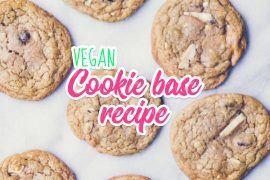 This year I tweaked my recipe slightly and they came out super fluffy, slightly doughy, and very flavourful, just the way I like them. I decided to try using coconut sugar instead of regular white sugar, which turned out fine, though coconut sugar makes them less sweet than usual. So if you want them sweeter, stick to regular organic white sugar. Combine the water and saffron and let sit for 30 minutes. Cut the butter into cubes. Crumble the yeast and mix together the milk, butter, and saffron+water mix in a large bowl or in a kitchen aid with the dough hook attachment. Add the sugar, salt and flour and knead the dough for 20 minutes by hand, or 15 minutes in a kitchen aid. Cover the bowl with a clean towel and let rise for 1 hour. Place the raisins in a little bowl of water and let soak for 30 minutes while you prepare the buns. Lightly flour your working surface and tip the dough out onto it. 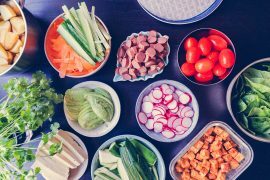 Divide it into about 25 equal pieces of dough and roll them out and then swirl the ends in opposite directions, meeting in the middle. 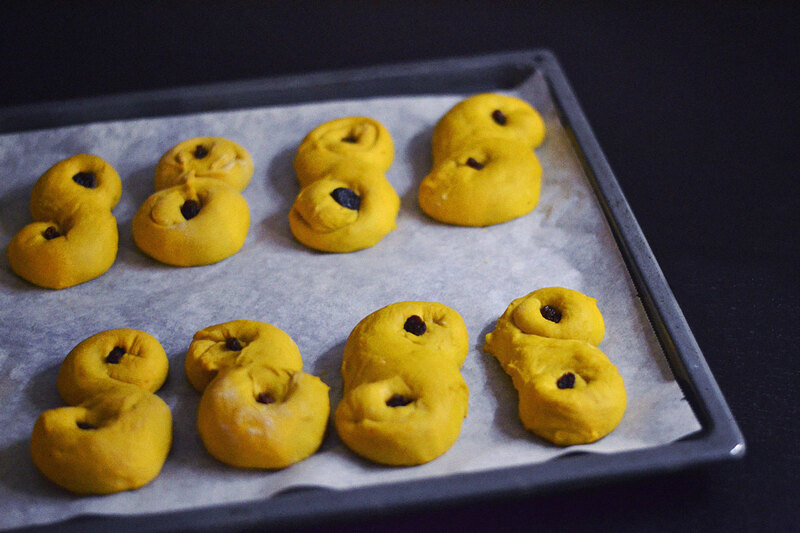 Place on a baking tray lined with parchment paper and stick two raisins in each bun. Cover the buns with clean towels and allow to rise for an additional 30 minutes. Preheat oven to 225 C / 437 F.
Brush each bun with milk. Bake in the oven for about 8 minutes (keep an eye on them, they should be slightly golden on top). Allow to cool on a wire rack under clean kitchen towels. 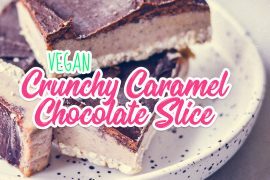 Look so yummy and lovely!